Although the TwinBee series is mostly remembered as a shoot 'em up franchise, it might come as a surprise that there were actually a few games which took on different genres. Rainbow Bell Adventures — which is coincidentally also the last game released outside Japan — tries its hand at platforming, bringing its own unique little quirks to the table. 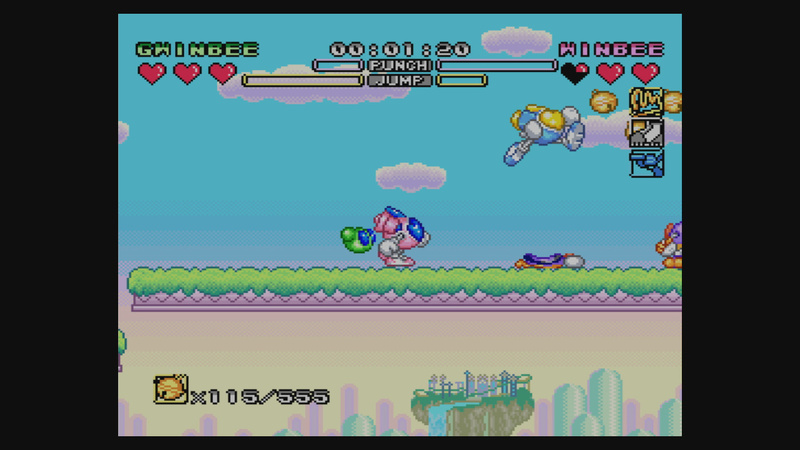 As in the other TwinBee games, the plot's pretty minimal. 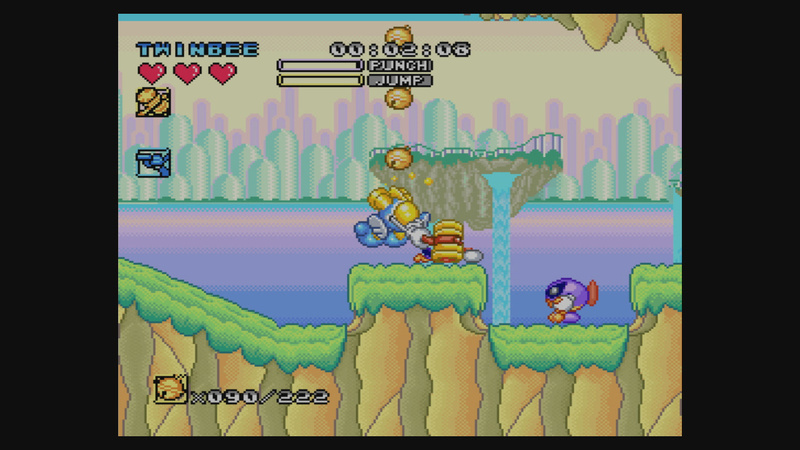 Dr. Warumon is plotting to take over the world again, so it's up to Twinbee and friends to stop him. Unlike the previous games, it's now possible to select what character you use, with a selection of Twinbee, Winbee and Gwinbee. Each comes with slightly different stats, so you can pick whichever best suits your play-style. The game starts out deceptively simple, with a few outdoor stages with hardly any enemies or obstacles. While your character of choice can simply run and jump around like any other platformer, with a punch as the main form of attack, both the jump and run buttons can actually be held down to charge, which is this main gimmick. A fully charged punch will let you throw a massive attack in any direction, while a fully charged jump will let you propel forward in any direction, which as you can imagine quickly becomes a key mechanic. This mechanic can be used to easily beat the first few stages in less than half a minute each, but the game quickly becomes less open, with most of the later levels being set inside maze-like indoors stages where the jet mechanic is not used for bypassing everything, but for simply flying over pits or ricocheting off walls to get to hard to reach spots. Like in the other TwinBee games, powerups play a large part, and they can still be found in the form of coloured bells. While they still give you things like a shield or miniature ships that trail behind you, you can also get some extra weapons, like a hammer or gun, or spike shoes that double your jump damage. The only difference is that the coloured bells are now dropped by enemies, rather than being hidden in clouds. While the Japanese version of the game allows you to progress through the levels in multiple orders, for some reason this was changed for the European release, forcing you to follow one straight path through the game instead. All of the levels are grouped into different areas, so first you'll go through an outdoors world, then a cave world, and so on. Naturally, each of these has a boss at the end, although these tend to be fairly easy to defeat, especially because fully charged attacks tend to destroy them in three or four hits. 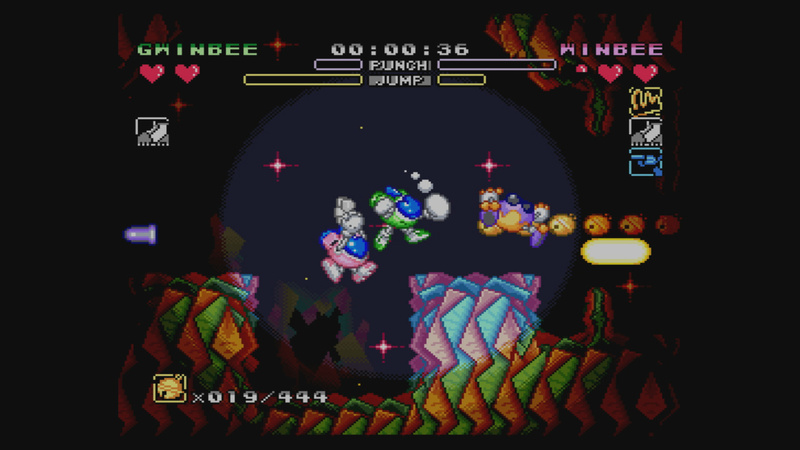 Although the main game is primarily intended as a single player experience, as in the other TwinBee games, it is still possible to have a friend join in. This is a little clumsy, however, because the screen will only keep up with one player — if you don't stay together, one player is going to be stuck fumbling around off-screen. There is also a battle mode where you can fight against each other in small arenas, which is much better if you plan on playing with a friend. As with the rest of the series, the game's graphics and music are quite upbeat, with detailed, colourful environments and fun, catchy music, naturally including a bunch of remixes for fans of the series. 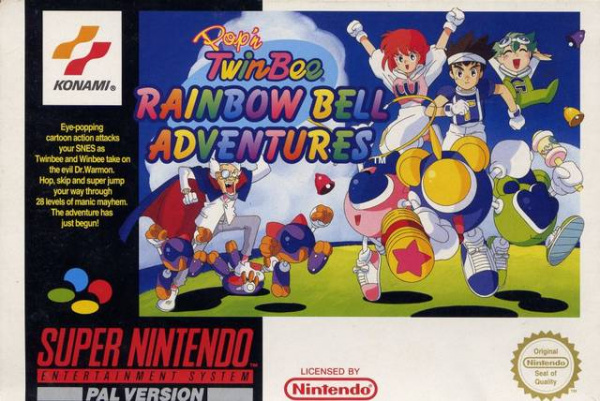 For the most part, Rainbow Bell Adventures is a pretty straight-forward platformer, though it spices things up a little with some fun TwinBee-based mechanics that make it quite enjoyable. It's not going to go down in the history books as one of the greatest platformers ever, but it's a fairly obscure platformer which has now finally been re-released, and one you're bound to enjoy it while it lasts. Good review! I did like the Famicom one back then and I was looking to get the SNES one but I'm not willing to pay that much. I will wait for a sale. This one however is different but still not sure if it's worth the price. Do we have a list/discussion of these 50Hz/60Hz games in the forums or what's the impact/difference in gameplay? Link would be appreciated. @outburst It says before you download it if you look at the more information. Super Metroid / A Link to The Past / These two are the ones I would have got otherwise. Kirby's Adventure - NES I believe is particularly broken - Kirby is full speed the enemies are slower. (And maybe Balloon Fight I dunno what they did with that but I am not going to be getting it). did this ever appear in uk cant remember ever seeing it or reading about it. 50hz JUNK completely RUINS gameplay and is unacceptable in 2014 (actually forget that it was unacceptable way back in the 90's) and when i read comments in other threads about people from europe waiting to purchase it or similar PAL crap all i say is gamers dont know their beans. @Swithom i so desperately wanted to play Super Metroid on my Wii U until i found out it was the 50hz version i couldn't do it its just not the same gaming experience on 50hz to me it seems like the controls, animation and music are going through Mud. 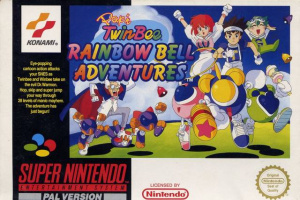 As a gamer who only owns the Super Famicom original TwinBee: Rainbow Bell Adventure, I must apologize to all PAL gamers about the benefits they're missing out on. Moving past that though, this spin-off is really great! It's got lots of fun gameplay (though the jumping/hovering will have to carefully be implemented as holding on to the B button too much and accidentally letting it go will have you skyrocketing), sweet pastel-toned visuals (with a pretty-looking Aurora Borealis in some segments), lots of secrets, tons of replay value, nice music, and several endings depending on how many of everything you got; I just need to gather two more (hard to find) fairies and then I'll score the best ending, yay! Not as excellent as Pop'n TwinBee, imo, but it comes close; and even if I wasn't a fan of the series, I would still consider it solid entertainment. It's got the best elements of Sonic the Hedgehog (speed), Bubsy (the lookaround), and Rocket Knight Adventures (rocketry) all rolled into one. My fifth SFC cart that I got in 2012 when I started importing SFC carts, and one of my favorites from 1994. Still wish it got an American release, but at this point it's very unlikely things will change. I hope this comes to usa, i want to play it! I hope this and the other come to US. Aside from the 50hz issue, the PAL version of this game had several cuts which make it inferior to the Japanese release. Very poor decision by Konami to not release the JP version instead. @Anguspuss Yeah, it was definitely released in the UK...I played it a couple of times on the SNES demo pod they used to have in GAME and remember seeing it on sale, though I never picked it up back then. Downloaded the VC version last week though, and it's still as fun as I remember. Being 50hz, particularly for games like this really doesn't harm the gameplay anywhere near as much as some fanatics would like people to believe. I don't think it was ever released in the US either, so it's either an untranslated 60hz version or a translated 50hz one. A truly fantastic game. I discovered this one back in the later 1990s when ebay was an infant and over time I picked up a couple dozen super famicom carts. It's a really well made platforming game with all the fun spirit of Twin Bee. Sounds good. I hope it eventually comes to North America. Very poor decision by Konami to not release the JP version instead. They're not going to release a Japanese language version when a english version exists, even if it is in 50hz. Perhaps they should release both versions for the cost of one so that players can choose which they want to play. They should have already made their research on how to convert 50Hz SNES games to 60 by now, in any case. Like, almost 10 years ago. Dangit, come to the US!! !